FARMINGTON HILLS – Sam Evola won a state title two weeks ago. Now, he’s the 2018 Mr. Hockey winner, too. 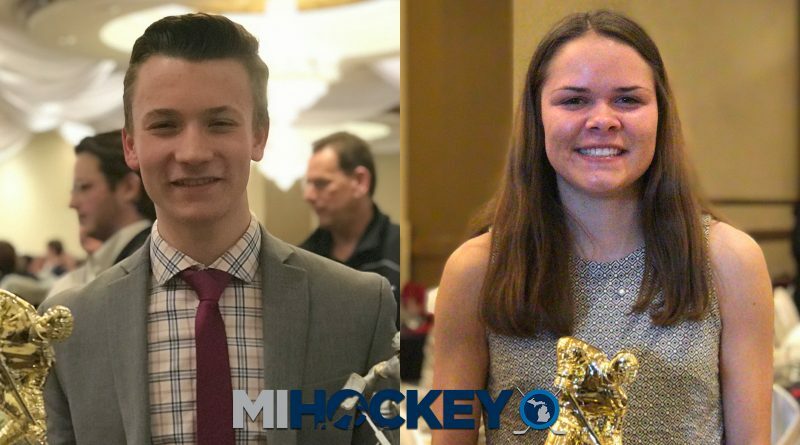 The Detroit Country Day goaltender was given Michigan high school hockey’s version of the Heisman Trophy Sunday afternoon at the all-state banquet in Farmington Hills. Evola registered some remarkable statistics en route to a state title in 2017-18. 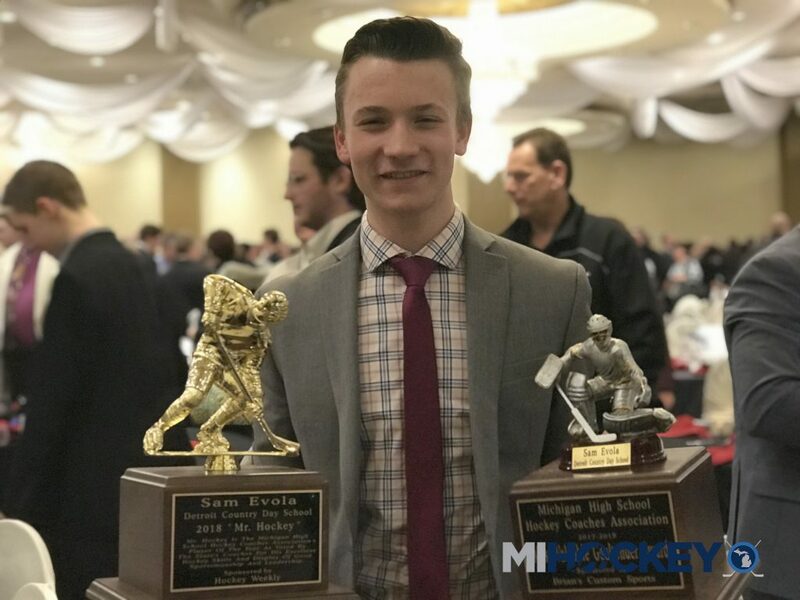 With seven shutouts throughout the season, he was able to finish his high school hockey campaign with a goals-against average below one; Evola recorded a 0.97 GAA during his 21-2-0 season. He also held a .954 save percentage on the year. On March 10, Evola led DCD to the school’s first hockey state title in three decades. More on that here. 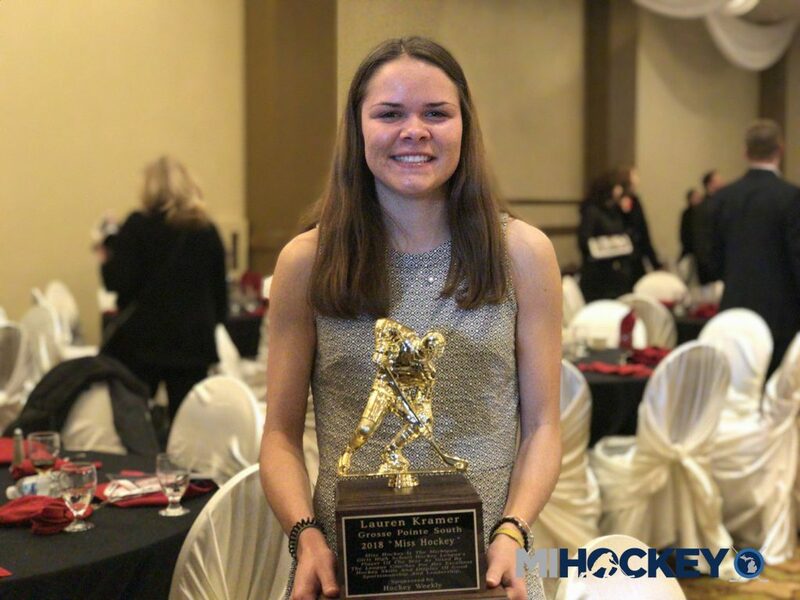 Meanwhile, Lauren Kramer of Grosse Pointe South was named the 2018 recipient of the Miss Hockey award, presented each season to the top player in the Michigan Girls High School Hockey League. Kramer posted 2o goals and 17 assists for 37 total points in the 2017-18 season, according to the Michigan Girls High School Hockey League official website. She also led her school to a state title. You can see photos from that game here.